No. The boosters and core stage of the rocket are not recoverable. 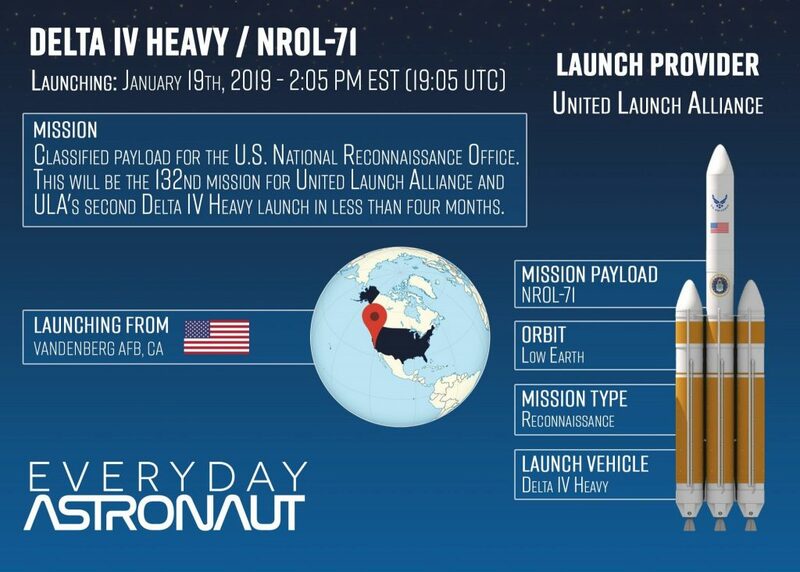 11th flight of a Delta IV Heavy, 38th flight of a Delta IV rocket, 1st mission for United Launch Alliance in 2019, 132nd mission overall for United Launch Alliance since forming in December of 2006. Maybe for even more fun you can watch with Tim Dodd, The Everyday Astronaut, starting at T minus 30! Come ask questions and join the conversation live! The first stage of the Delta IV Heavy consists of three common core boosters, each with a RS-68A engine burning liquid hydrogen and oxygen. The outside boosters burn at full throttle from launch until fuel depletion, while the center booster throttles down shortly after lift off and throttles back up to 100% after separation of the boosters. The Delta Cryogenic Second Stage (DCSS) has a single RL-10B-2 engine which also burns liquid hydrogen and oxygen. Due to the classified nature of the mission, the details of the satellite, its purpose and its orbit are unknown. Tim Dodd, The Everyday Astronaut, will be livestreaming this launch starting at T minus 30 minutes. So come ask questions and join the conversation live! If you want the best way to know when a launch is coming, I’d suggest downloading the Launch Alarm app to stay in the know! AHHHHHH! What happened? Why did it not launch? They detected excessive amounts of hydrogen fuel at a test port which apparently can indicate a fuel leak, and needed to fix the problem. Is it ever going to happen? I would love to go up that way and get a good view of the launch. But, I’m afraid it would all be a waste of time. Is this the sixth time the launch has been delayed? What a bummer. Talk about having a bad month. Someone isn’t getting any sleep over the holidays. You need to update that this is not the 9th mission for ULA in 2018. It may be the first of 2019? I’m just shopping for a shirt and decided to ask a related question to today’s launch. I had no idea that deployable vaccuum nozzles were being used in the RL10B-2 until today. I don’t recall seeing a video of any recent Delta IV launches where it deployed…are these nozzles being used then, and also, with the weight being twice that of the rl10 standard with about ten percent more thrust, in your opinion is all this complexity and cost worth it. Is ULA going to dump it for the next versions of their rockets? Keep up the awesome work.